Though the brand isn't selling vehicles in the US anymore, buying aftermarket Suzuki car parts online is still very easy. If you are looking for new components like brakes, fuel pumps, head gaskets, or struts, CPD is the place to find them. We carry a wide variety of replacement online, at super low prices. So don't think that you have to go to a salvage yard to find used equipment that's worn out and likely to fail within a short time, leaving you or a loved one stranded on the side of the highway. Simply order new aftermarket or genuine OEM parts online from our web site today. The Suzuki Motor Corporation was formed in 1954 after its tremendous success in the motorcycle market. Initially, the company started as a loom manufacturer at the very beginning of the 20th century. After WWII, the cotton market collapsed and the founder, Michio Suzuki, began making Suzuki car parts for engines. Its first small-car was the Suzulight, which sparked the age of Japanese lightweight, fuel efficient automobiles. This was followed by the Fonte and Jimmy models in the 1970's, and the badge-engineered Chevrolet Sprint (known as the Cultus in Japan) in the 1980's. While the company has been mostly a motorcycle and ATV brand, they have been consistently and reliably producing Suzuki cars and light trucks for decades. They began selling automobiles in North America in 1985 with the Samurai micro SUV, and never did any Japanese auto manufacturer sell more vehicles in its first year. 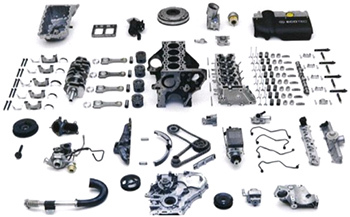 This popularity and the availability of replacement aftermarket Suzuki components is the reason why there are still a great many of these sporty cars and mini-SUV's on the road today, including the Grand Vitara, Aerio, Forenza and XL-7 models. CarPartsDiscount.com is not associated with the above carmaker in any manner. All images and references to the marque, vehicle model names, logo and shapes are for reference and identification only. All trademarks, tradenames and/or service marks are the property of their respective holders.